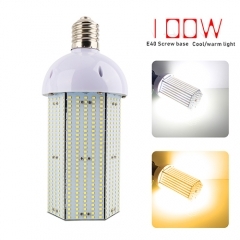 Our LED corn bulb with an E27/E40 Medium Base (Standard), which are easy to install(just screw in). 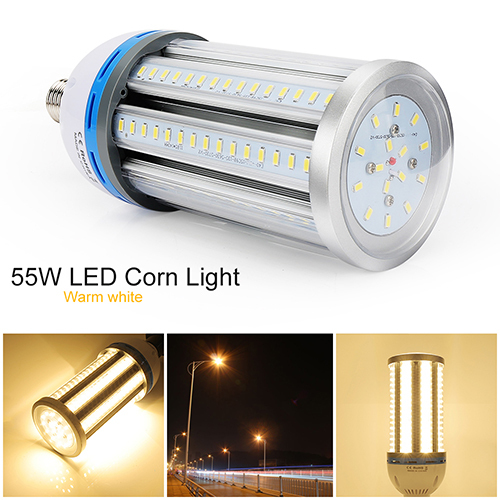 To retrofit your old lighting fixture with our Led corn light is the best plan, you may pay less for the electrician or even free and still retain fixture original appearance. 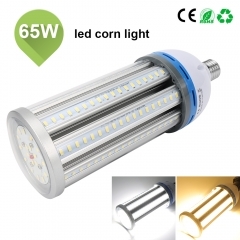 55W LED corn light produces up to 5000 Lumens at a stunning 135lm per watt ensures fabulous luminous efficiency. Replacing 200W Metal Halide Bulb/HPS/HID with 80 percent energy saving and no maintenance required during 50,000 hours life. Rated life of 50,000 hours is 4 times longer than MH or HID bulbs. 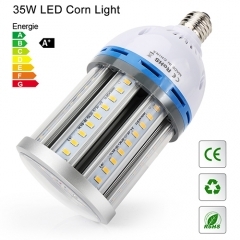 We guarantee you every LED corn light bulb has been rigorous testing before bringing the best-LED products to our customers. We stand by our words with our 2-year unlimited warranty. 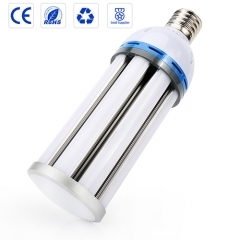 1.Q: Is this a direct replacement for metal halide bulbs or do you need to bypass the ballast and capacitor? A: I would check with a qualified electrician before doing anything......But I believe you need to bypass the ballast as that is how ours are done. Works very well. 2.Q: Will this bulb operate at 15 deg. and 100 deg.? 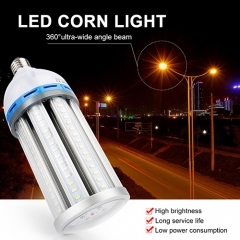 A: Most LED corn cob lamps are rated -25 to 55 degrees Celcius. They are designed for street lighting and used in every state. We use them in WI wheres its -40 F and in GA where its 110 F. We have never had a temperature related issue. A LED lamp likes cold weather. The main cause of failure is overheating the LED driver. The actual LED never fails. Now if you were referring to the angle of installation instead of temperature then the lamp works well in any angle as long as the socket can support the weight of the lamp. The larger the lamp the more it weighs. 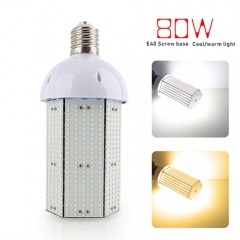 You can get corn cob lamps in an E27 (standard medium base) base up to 55W. 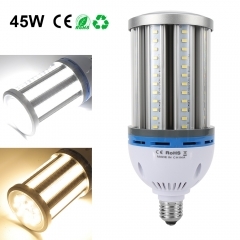 You can get base lamps from 35W to over 65W. 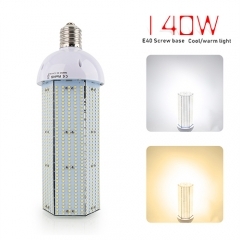 The 120W lamps replace 400W MH lamps. We prefer the IP64 rated lamps which are dustproof and waterproof. We use the 35W and 65W in garages and shops. We use the 35W and 65W in warehouses, parking lot lights and streetlights. In an HID fixture be sure to bypass the ballast. The lamp will run on 120V, 208V, and 230V. The biggest issue we have is the size of the lamp base. You have to use a porcelain socket extension on the most parking lot and street light fixtures. Porcelain sockets adapters are available in medium to mogul, mogul to medium, medium to medium and mogul to mogul. We highly recommend these lamps and only use Stephen. FYI... a study is being done on the current use of 5000K lamps. The human eye can not register the blue spectrum of light very well in a 5000k or 6500k. Drivers are having issues with parking lot lights and streetlights using that color of the lamp. We still use the 5000k in those applications but have started using 4100K for garages, warehouses, and security lighting. A: There is no fan. 4.Q: Can this light be used in an exposed application outdoors? A: I have two of them in a street light type fixture that is open on the bottom and so far, no problems. I really like mine. 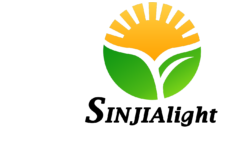 5.Q: will this led corn bulb operate on 220 voltage 120 watts 100-277v? A: Yes it will. I used the 80-watt bulb. It was very bright. 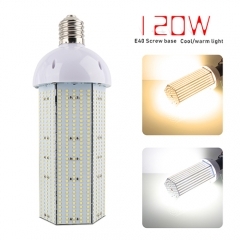 120 watts is 50% more wattage and will be VERY bright. 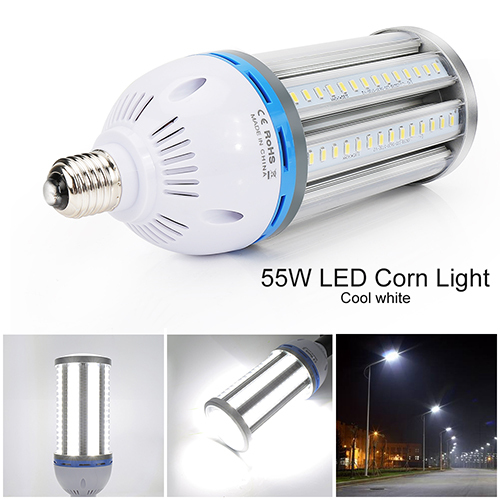 Super Bright 140W LED Corn Light Bulb, E40 La..
Super Bright 120W LED Corn Light Bulb, E40 La..
Super Bright 100W LED Corn Light Bulb, E40 La..
Super Bright 80W LED Corn Light Bulb, E40 Lar..
65W LED CORN LIGHT BULB,6900Lumens, 162pcs SM..
65W Super Bright LED Corn Bulbs Best For Outd..
55W Super Bright LED Corn Bulbs Best For Outd..
45W Super Bright LED Corn Bulbs Best For Outd..
35W Super Bright LED Corn Bulbs Best For Outd..